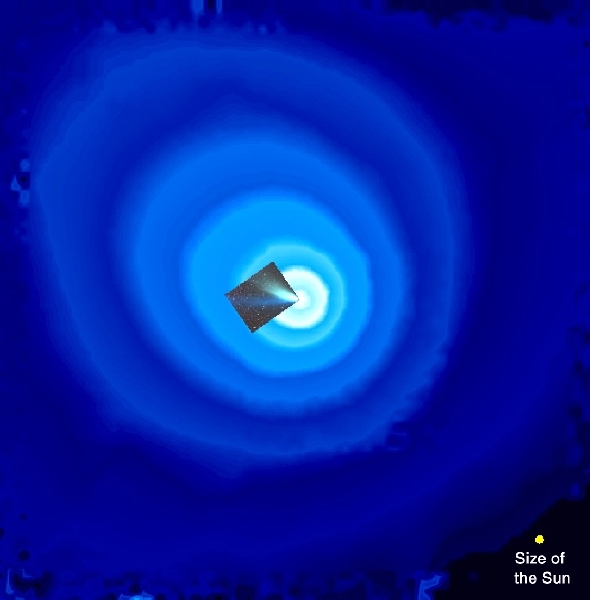 SWAN observed a huge cloud of hydrogen, 70 times the size of the Sun, that surrounded Comet Hale-Bopp when it neared the Sun. 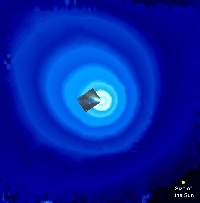 Ultra violet light, charted by SWAN in 1997, revealed a cloud 100 million kilometres w ide and diminishing in intensity outwards (contour lines). The cloud was generat ed by a comet nucleus perhaps only about 40 kilometres in diameter. The yellow c ircle (lower right) gives the size of the Sun. Solar rays broke up water vapor r eleased from the comet by the Suns warmth. The resulting hydrogen atoms shone by ultraviolet light invisible from the Earth's surface.